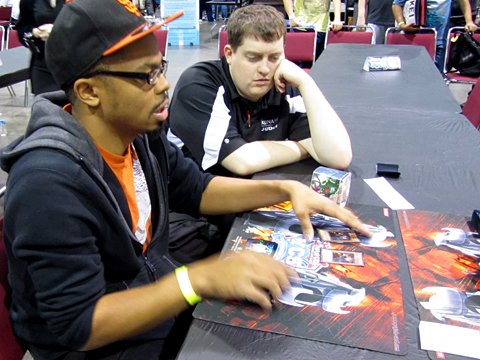 We saw New Jersey’s William Casaw in a Round 10 Feature Match earlier today. He wasn’t able to make any big moves in that match, but he still managed to fight his way to the Top 16! His opponent is Simon He, who hails from Nottingham in the UK! Only one Duelist can move on from here! 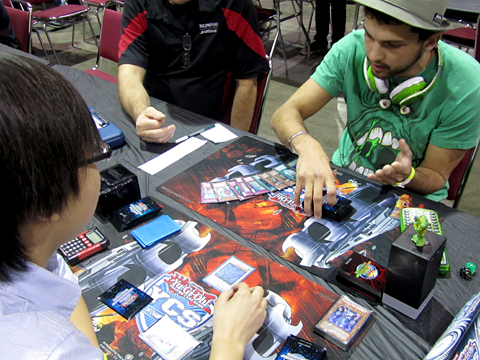 Simon started the Top 16 with a hand of Master Hyperion, Treacherous Trap Hole, 2 The Agents of Creation – Venus, Mystical Shine Ball, and Herald of Orange Light. He Normal Summoned Venus and activated its effect twice to bring out 2 Mystical Shine Balls. He stacked the Shine Balls to Xyz Summon Gachi Gachi Gantetsu. He Set Treacherous and passed. Simon drew Enemy Controller. He Normal Summoned his spare Venus. One Venus attacked William’s Set monster, revealing Dupe Frog! Even with the ATK boost from Gachi Gachi, Dupe Frog’s whopping 2000 DEF kept it on the field. Still during the Battle Phase, Simon Tributed that Venus for Enemy Controller to steal Dupe, then attacked directly with the other Venus. When it struck, William played his Gorz the Emissary of Darkness! He Special Summoned a 2000 ATK/DEF Emissary of Darkness Token. In Main Phase 2, Simon Normal Summoned his Mystical Shine Ball and stacked it with Dupe for Daigusto Phoenix! Simon drew Tour Guide From the Underworld. He Summoned it, and it brought Sangan to the field. Next, he used Daigusto Phoenix’s effect on itself. Tour Guide, Sangan, and Gachi Gachi attacked, then Daigusto Phoenix attacked twice to finish William off! Simon He takes a decisive victory, fully utilizing the power of Mystical Shine Ball! The Duelists moved to their Side Decks. 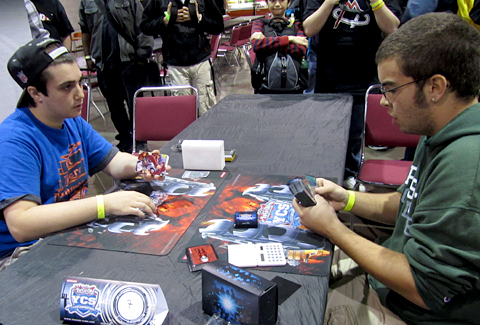 Simon knew what kind of Deck William was playing, and sided in Gozen Match, among other things. William began by Normal Summoning Swap Frog. He used its effect to send Treeborn Frog from his Deck to the Graveyard. He activated Swap’s other effect and returned it to his hand. Simon’s hand was Master Hyperion, The Agent of Mystery – Earth, Effect Veiler, The Agent of Creation – Venus, Mind Control, and Black Luster Soldier – Envoy of the Beginning. He Normal Summoned Venus and activated its effect twice, bringing out 2 Mystical Shine Balls. He entered his Battle Phase and attacked with Venus. Next, he attacked with each Shine Ball. In Main Phase 2, he stacked them for Gachi Gachi Gantetsu in defense position, then used Venus once more for a Shine Ball in defense position. William returned Treeborn to the field. He discarded Dupe Frog to Special Summon Swap Frog from his hand, which sent Ronintoadin from the Deck to the Graveyard. He activated Salvage, returning Ronin and Dupe to his hand, then returned Swap to his hand with its effect. He discarded Ronin to Special Summon Swap again, which sent Poison Draw Frog to the Graveyard. He returned Swap once more and discarded Dupe to Special Summon it again, then sent another Ronin to the Graveyard. He banished Poison Draw Frog to Special Summon Ronin from his Graveyard. He returned Swap to his hand once more, then banished Dupe to revive the other Ronin. He Tributed his Treeborn and 2 Ronintoadin for Obelisk the Tormentor!!! Obelisk obliterated Venus, dealing 2000 damage! William Set a back row card before ending his turn. Simon drew Mystical Space Typhoon. He activated it to destroy My Body as a Shield, then Normal Summoned Earth. Earth added Venus to his hand. He tuned Earth to Shine Ball to Synchro Summon Armory Arm, then Special Summoned Master Hyperion by banishing Earth. He equipped Armory Arm to Hyperion, and it attacked Obelisk! Thanks to Armory Arm and Gachi Gachi, Obelisk went down and William took 100 Battle Damage, then 4000 more damage from Armory Arm! William Normal Summoned Swap Frog, sending Poison Draw Frog to the Graveyard. He banished it to bring back Ronin, then banished Treeborn for his other Ronin. He stacked both Ronins and Swap for Dark Mist! Before he could enter his Battle Phase, Simon negated Dark Mist’s effect with Effect Veiler! William Set a back row. Simon drew Dark Hole. Hyperion banished Shine Ball to destroy My Body as a Shield, then Simon activated Mind Control to steal Dark Mist! Hyperion attacked directly, ending the match! 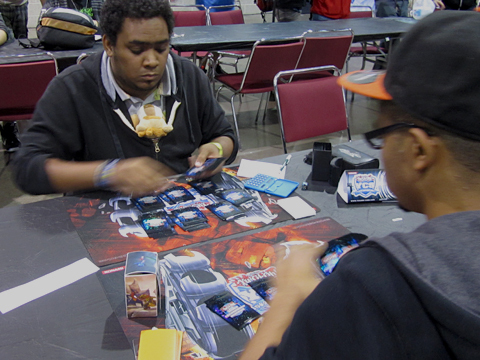 Simon He overcomes Obelisk the Tormentor in battle to move on to the Top 8!